There's an even bigger problem. There's someone who is always there, listening to every word you utter and taking those messages to heart. That someone is you, and using weak words could jeopardize your success in life and in business. Our leadership training helps build confidence when speaking. "I'll try to get that new account." Don't believe him? Try to stand up right now. If you are now standing, you didn't "try" to stand up... you stood up. Using the word "try" is non-committal and leaves people hanging as to whether or not you'll be there for them. Either you will make the meeting or you won't. The same goes for commitments or promises you make to yourself. "Try" gives you wiggle room to shirk your responsibilities and your goals. It gives you the ability to not apply yourself 100% and then say, "Well, I didn't want it that badly anyway." When you eliminate "try," you will do everything within your power to reach your goals. "I could introduce you to Bob in Accounting." You could... but you could also choose not to. When you use "would" or "could" in a sentence, your listener is waiting for the "but." Much like the word "try," if you are going to commit to something, commit to it. "I might go to Happy Hour around 4 today." And you might not. If you choose not to, your coworker is going to be sitting alone at the bar. Make the commitment to show or be clear that you won't be attending. Don't leave them wondering. "I want to send birthday cards to my staff this year." What else do you want to do? Win the lottery? Teach your dog to vacuum? It creates space for the "but" (I want to send birthday cards to my staff this year, but I don't know if I have the time). It suggests some action will be taken in the future but the future is vague and can't be placed on a calendar. Use this instead: "I will send birthday cards to my staff this year." "I should go to the gym after work." But you won't. Once again, you are not committing to this action. As a leader, you are a role model for the people around you. Show them that you are someone worthy of being followed by making definitive statements. Using the word "should" also reinforces the fact that you aren't doing it yet. Rather than giving yourself an easy out, understand your reasoning behind this desire and reinforce the statement with that reasoning. Use this instead: "I will go to the gym after work." or "Going to the gym after work will give me more energy and help me lose weight." When you tell someone else they "should" do something, it's not actually giving them advice but rather criticizing their behaviors. If you need to communicate an order to a subordinate, say something along the lines of, "I need you to have the reports on my desk by Friday at 4 pm." "We are picking up stuff from our clients." What? What is being picked up? "Stuff" is generally used as a placeholder for nouns of all shapes and sizes. This is vague, and if it's not important enough to mention by name, it doesn't need to be mentioned at all. This detracts from your credibility in a conversation. As Presentation Skills Coach, Patricia Fripp says, "Specificity builds credibility." Use this instead: "We are picking up the packing materials from our clients." 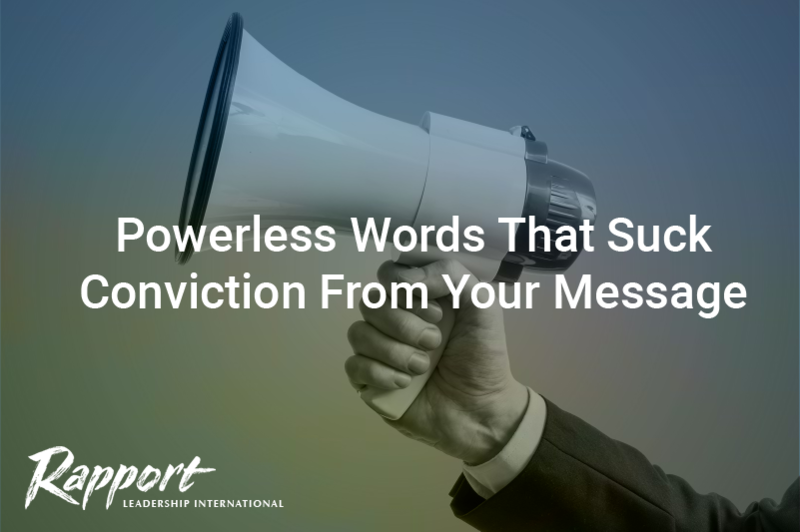 Now that you are aware of the powerless words that worm their way into your speech, keep an eye out for these phrases as well. "I just called to say..."
Words like "just" can make you seem like you are on the defense or even apologizing for your behavior. Use this instead: "I called to say..."
"Honestly, I don't think that's a good direction for us to move in." If you're being honest about this statement, were you lying about the last one? Qualifiers like "honestly," "possibly," and any other adverb you can conjure up to add in front of your statement weakens whatever it is you're saying. Say what you need to say and don't feel the need to qualify it in any way. "Umm, I think it’s advantageous to, umm, expand into foreign markets, umm, to increase our reach." That's as painful to write as it is to read. Sounds like "umm," "er," and "oh" are verbal pauses that you use to fill the space when you're thinking of what to say next. They call your communication prowess into question when used excessively. Become aware of these hesitations and slow down your speech so your brain can formulate what comes next. It's also okay to be silent for a moment while you think. "There are some major changes coming down the pike. Okay?" When you end a sentence with a questioning word like "Okay?" or "Right?" You give people the opportunity to disagree. While there are certain circumstances where some head-nodding is a good thing, when you are making a statement, it should be communicated as a statement, not a question. "In my opinion, the client would be better served by using this product." Sentences that start out with "in my opinion" or "I'm wondering if" shift the responsibility from you to another party. A leader takes responsibility for their beliefs, their words, and their actions. Just as there are words, phrases, and speaking patterns to avoid, there are also ways to speak that will heighten your authority and convey confidence to your audience. Take a moment to formulate what you want to express in your head so you don't have to articulate your thinking time. You do not "think," "feel," or "believe." You know. Project confidence with your words. You know what you want, and you can and will get it. Earlier, we discussed ending statements with questions... right? When you say something, say it proudly and without asking for agreement or buy in. If you are looking for confirmation that they understand you, ask a specific question to gauge where they are at. In order to garner respect from others when you speak, you must do the same for them. Avoid interrupting people because it communicates that they are not important. Our words have the power to encourage new ways of thinking and influence behavior. When we dilute this speech with weak words or phrases, we dilute our message. It takes some work, but when you become aware of these words in your day-to-day language, you can eliminate them and communicate strength, confidence, and conviction when talking to others and to yourself. The best way to know if your sentence is filled with weak words? Repeat the sentence without the word in it. If it conveys the exact same meaning, leave the word out. And remember, as powerful as our words are, we must stay true to them by following through with our behavior.